It is a pleasure to be here in Toronto today, and I’d like to thank the Toronto Region Board of Trade for the invitation. In many ways, 2019 has gotten off to a challenging start. What’s happening in the housing market here at home, lower oil prices, the trade conflict between the United States and China, and Brexit are top of mind for all of us. Canadians will be more confident facing these challenges if they feel secure in their jobs. This is vital to your bottom lines as business people: without secure, good-paying work, sooner or later demand for your products and services will suffer. For central bankers like me, the job market is a bellwether of financial health and a useful gauge of inflation pressures. And by many measures, the labour market in Canada is in good shape. The unemployment rate is at its lowest level in records going back more than 40 years. Firms across the country tell us that it’s difficult to fill openings. I suspect many employers here in Toronto can relate. These are signs of labour market strength. Certainly, many are benefiting from the positive overall environment. Not everyone is, though; recent layoffs in the auto sector have touched many families in this region, and there have been layoffs and closures elsewhere in the country. Moreover, wages overall in Canada are not rising as fast as we would expect given how low unemployment is. How well is the job market really doing? If firms are finding it so tough to fill jobs, why don’t they just offer higher wages? What structural factors could weigh on wage growth going forward? The answers to these questions will help the Bank find the right path for interest rates to meet our inflation objective. They will also help businesses and governments develop strategies to boost Canada’s prosperity over the longer term. So, how well is the job market really doing? Let’s start with a few basic facts. Last year, the economy added a net 163,000 jobs, all full-time positions. The unemployment rate fell to 5.6 per cent, a historic low. The participation rate for prime-age workers (those aged 25 to 54) is around 87 per cent, near its all-time high. This uncertainty means that it is imperative to look beyond such measures of “full” or maximum employment toward other indicators of labour market slack. In this instance, the Bank has pointed to relatively subdued wage growth as a possible sign that the job market may have more room to run. Economic theory tells us that when the actual jobless rate is at the natural rate, an economy is essentially at full employment. At that point, we would expect wages to be rising at the same pace as the target inflation rate plus the trend rate of productivity growth. This is because the strongest underlying factors that determine worker pay in real terms are how productive workers are and their value to an employer’s production process.4 So, for Canada, this implies wage growth of around 3 per cent—2 per cent for inflation and 1 per cent for trend productivity growth. Wage growth has picked up considerably to average about 2½ per cent in 2018, compared with 2 per cent over the past five years.5 But we are still shy of what one would expect in a tight labour market. The story is similar in the United States. The US jobless rate has been below 4 per cent for a while. This is much lower than the estimate of the US natural rate—currently pegged at around 4½ per cent.6 Yet, wage gains only recently reached the sum of inflation and productivity growth. In Canada, regional and sectoral factors can explain a lot of why wage growth has been tame. The steep drop in oil prices that occurred in the second half of 2014 had an impact that rippled across Canada and is still being felt. Wage gains in energy-intensive regions continue to lag behind those in the rest of the country. To give you a sense of how big a deal this is, wage growth in the third quarter of 2018 was just under 2 per cent in Alberta, Saskatchewan, and Newfoundland and Labrador. It was about three-quarters of a percentage point higher in Ontario and Quebec, so closer to the 3 per cent one would expect. That divergence makes sense when you consider that investment and jobs in energy-intensive regions respond to oil prices. In fact, there was a massive increase in employment in these regions from 2000 to the end of 2014, and they led wage growth. With much lower oil prices since 2015, employment in the oil and gas sector has fallen by about 20 per cent—that is about 30,000 jobs. Other goods-producing sectors, such as manufacturing and agriculture, are also becoming less prominent employers.7 Instead, a range of service sectors have contributed to job growth, in exactly the places you would expect given longer-term trends. Digitalization has led to a burst of jobs in computer system design—up by around 40 per cent over the past five years. There has also been a boom in health-related jobs, particularly elder care. Yet, even after accounting for these regional and sectoral factors, wage growth overall is still a bit short of what one would expect at this stage. This is particularly puzzling when you consider what businesses are telling us about how hard it is to fill jobs. Firms in our latest Business Outlook Survey reported one of the highest levels of labour shortages since the Great Recession. And job vacancies continue to rise, now totalling about 550,000. Why aren’t labour shortages driving up wages? If the right workers are so hard to attract, why not simply offer more money? Many firms are doing just that. However, other factors must be holding back wages, or the national numbers would be higher. As far as I can tell, no one has found a smoking gun. But there are at least a couple of compelling suspects. The first is that it might be difficult to find the right person for the job. Attracting the right talent is rarely just about money. I can tell you, in my business it is not easy to find all the specialized talent the Bank needs. Estimates suggest that about 1 out of every 10 jobs in Canada is affected by mismatches between the skills that the job requires and the skills that workers actually have.9 The sectors with skills shortages are no surprise: health care and the digital economy top the list. Meanwhile, sectors like manufacturing and natural resources have a surplus of people with the required skills. The second suspect is a sense of caution. People may be reluctant to search for a better job even if they would like one. The data bear this out. Turnover in the Canadian job market, a process known as job “churn,” is relatively low these days.10 Higher churn usually means higher wages, because the people willing to change jobs—to trade up—typically drive wage gains in the economy. Job churn is especially sluggish in oil-producing provinces, where wage gains have been most restrained.11 As a comparison, job churn in the United States has recovered more quickly, in part because the oil price shock was positive for the US expansion. That churn has supported US wage growth. Another suspect is geography. Canada is a beautiful country, but its sheer size does not help. The data show that Canadians have become more open over the past few decades to relocating for new opportunities.12 Still, it is no small thing to pull up stakes and move to a new city or province, often far from friends and family. If you are fortunate enough to find a job that is a good match for your skills and ambition, you still have to ask yourself: Will housing be affordable? Will the commute be a nightmare? Will my partner be able to find meaningful employment too? I’ll bet a few people in this room have had prize candidates slip away once they realized that they could not afford Greater Toronto Area housing prices, or were not keen to spend hours commuting to work every day if they lived further out. As the expansion continues, history tells us that job churn will pick up as employment continues to grow. This should lead to more employers finding it necessary, and worth their while, to offer higher wages. How innovation is playing out in the global economy is at the centre. Technological advances have lowered demand for many types of routine jobs, both cognitive and manual, in all advanced economies, including Canada. These losses have been more than offset by jobs in other sectors that are experiencing stronger employment and wage growth. High-tech workers are the most obvious example. At the same time, more and more workers have to compete for jobs with people around the world as firms work to stay competitive in global markets. Another effect of the most recent wave of innovation is the rise of “superstar” firms that are making the competitive landscape more challenging.14 While issues around market power are hardly new, control of valuable consumer data and of electronic platforms can act as modern impediments to competition. When a few firms dominate an industry, or a firm becomes the only major employer in town, workers have little choice but to stay in their jobs regardless of wages or other labour conditions. Consequently, those firms may feel less pressure to raise wages for many of their workers even as the job market tightens. It is not just digital firms: concentration is growing across many industries in some countries, including Canada and the United States.15 Because workers’ wages have not kept pace with gains in productivity over the last few decades, their share of income has fallen, particularly in the United States but also in Canada. The relationship between employers and workers has also changed. We know that employers are making greater use of employment agencies and short-term contractors to replace salaried employees. Unionization rates in the private sector are down. And we hear from labour market experts that this has changed the social contract between companies and their workers. The gig economy has also created a new set of jobs in Canada and elsewhere that reduces the bargaining power of workers as well. These non-standard jobs may have advantages, such as the ability to work as needed—Uber drivers come to mind—but many workers in these jobs indicate that they would prefer more stability. A recent Bank survey of Canadians found that roughly one-third of respondents were participating in some form of non-standard or gig employment.16 For many it was as a side job to top up income. These workers were more likely to be young and to live in provinces where jobless rates are historically high. By our count, the number of people in Canada doing non-standard work because of weak economic conditions who would rather be doing something more formal is equivalent to about 700,000 full-time positions. To be sure, monetary policy can do little to directly influence structural issues affecting the labour market and the wider economy. My job is to keep inflation low and stable so that people like you in the business community can operate in a predictable environment that supports sustainable economic growth. That said, there is considerable scope for other public policies, and for businesses, to enhance the long-term prosperity of workers—your customer base—and by extension the economy. We all recognize the importance of investing heavily in the right skills for the digital economy, and for other growing sectors like elder-care services. While governments may be on the front lines, businesses need to play a stronger role in partnering with schools and universities. We want more students to gain pertinent experience and to develop the working relationships that foster entrepreneurship. This has been happening for years. For instance, about two-thirds of University of Waterloo students are in co-op placements with firms across Canada. Other schools, such as Carleton University, are expanding their links to locally based tech industry leaders. And it does not stop once you have made the hire. More businesses need to invest in their employees throughout their careers. Many tell us that is exactly what they are doing, through intensive in-house training. What is less prominent in discussions on how to improve the job market is supporting worker mobility—this would help businesses attract the right people for the job. Affordable housing is front and centre. It is to a large extent an issue of supply. Then there is the issue of transportation infrastructure in major job markets. And supporting mobility also includes removing barriers to interprovincial trade. Finally, let’s not forget that the competitiveness of Canadian businesses is at the foundation of a robust job market. The tax changes made by the federal government last autumn are a positive step in this regard and should lead to more investment in capacity and productivity. Higher productivity would make it easier for wages to rise faster without increasing inflation pressures. Strategies geared to developing and adopting new technologies in a digital and data-driven economy—across all sectors—will also be critical to our economic potential. It is time to wrap up. Despite a challenging start to the year, the labour market in Canada is in a solid place overall. It is worth looking under the hood of the job market to better understand emerging inflation pressures and what strategies might add to Canada’s prosperity. Some of the weakness in wage growth can be explained by continued adjustment in energy-intensive regions to lower oil prices. There are also some structural factors both inside and outside Canada that may continue to weigh on overall wage growth. That said, we also need to be mindful of stronger wage gains and signs of labour shortages in other parts of the economy. Monetary policy must be forward-looking. As you know from our latest outlook published a couple of weeks ago, the recent weakness in oil prices and softness in housing mean that we expect growth to slow temporarily. We expect the economic expansion to pick up again after this detour, in the second quarter of 2019. This should lead to a pickup in wage growth as well. There are risks on both sides of this outlook, so we will continue to pay close attention to wages and to other developments that are driving our projection for inflation. This includes how oil prices, the Canadian housing market and global trade policy evolve. 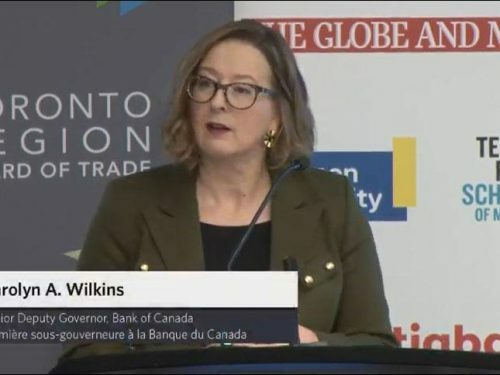 Rest assured that the Bank of Canada will do its part to meet our inflation objective. And as I’ve just discussed, businesses and governments can help build an even more vibrant job market by investing in education and training, encouraging labour mobility, and improving the competitiveness of Canadian companies. I would like to thank Eric Santor, Rhys Mendes and Michael Francis for their help in preparing this speech.